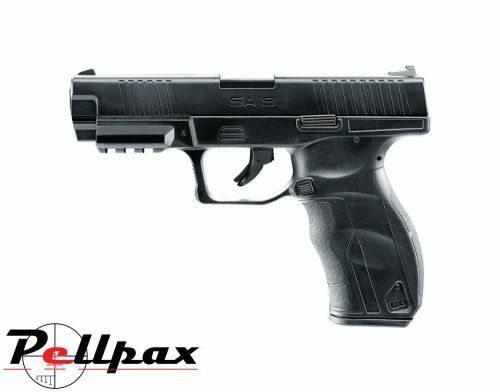 This pistol from Umarex is a CO2 blowback pistol which fires 4.5mm BBs from its magazine with fantastic velocities. The pistol is powered from a standard 12g CO2 which is housed within the grip as to not disturb the great looks of the pistol, and one co2 capsule provides around 50 shots per each one. The BB magazine is a stick type and slots in the front of the hand grip and holds 20 BBs for a fast and fun shooting experience. The pistols frame is made from a high impact synthetic polymer which takes all the stresses from shooting exceedingly well. The underside of the front of the frame has a weaver rail incorporated for the fitting of a laser or torch. The pistol has a double action which means it fires a shot on each pull of the trigger, until all of the shots in the magazine have been fired.